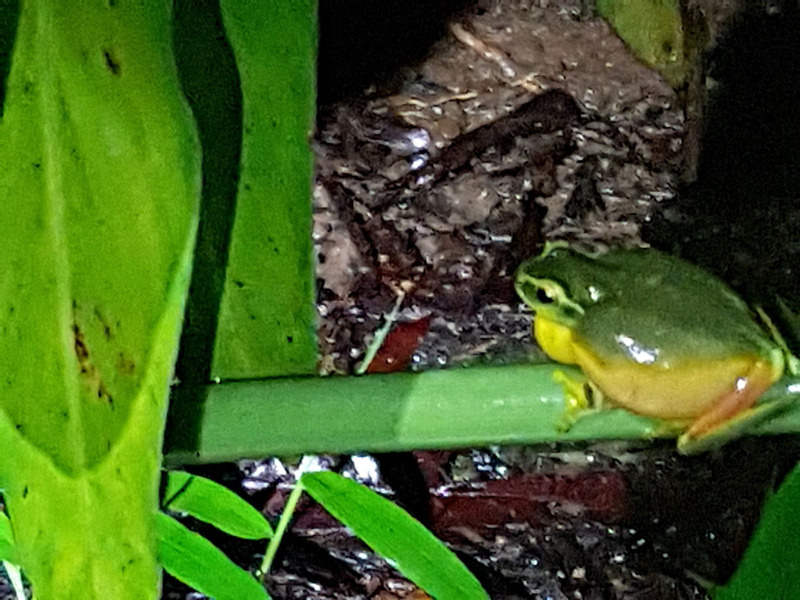 One outstanding characteristic of the Daintree rainforest is that it is very wet. Not only is there high atmospheric humidity (85% or more is usual), but the annual rainfall is often several metres a year. All of this water means that not only are there numerous permanent creeks flowing throughout the region, after a heavy rain, a lot of low-lying areas (like the station's property) suddenly find themselves criss-crossed by tiny, rapidly-flowing "ephemeral creeks" - bodies of water which exist only after a heavy rain. The one in the picture is on the grounds of the station. 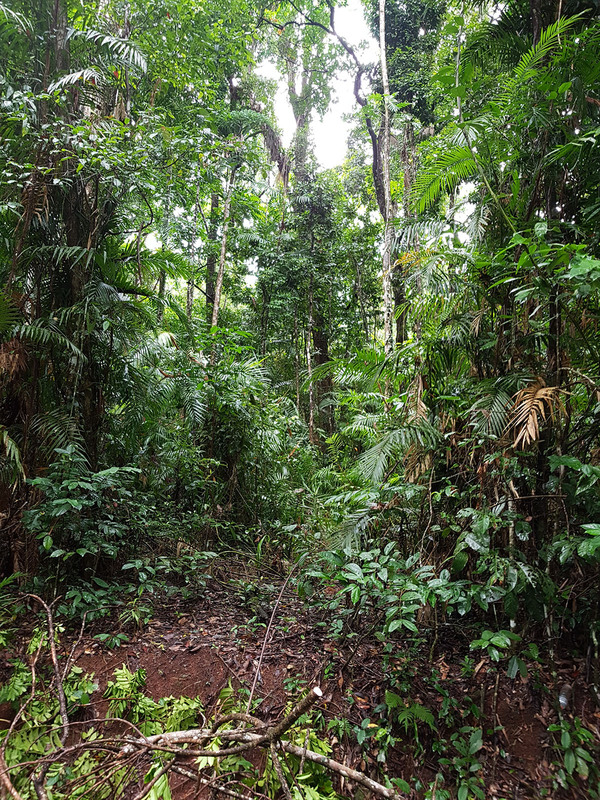 This picture, taken at the station, is an amazing example of what dedicated rainforest regeneration can accomplish over thirty years. When the station was founded in 1988, the grounds were not much more than a large, cleared field with hardly a tree standing. 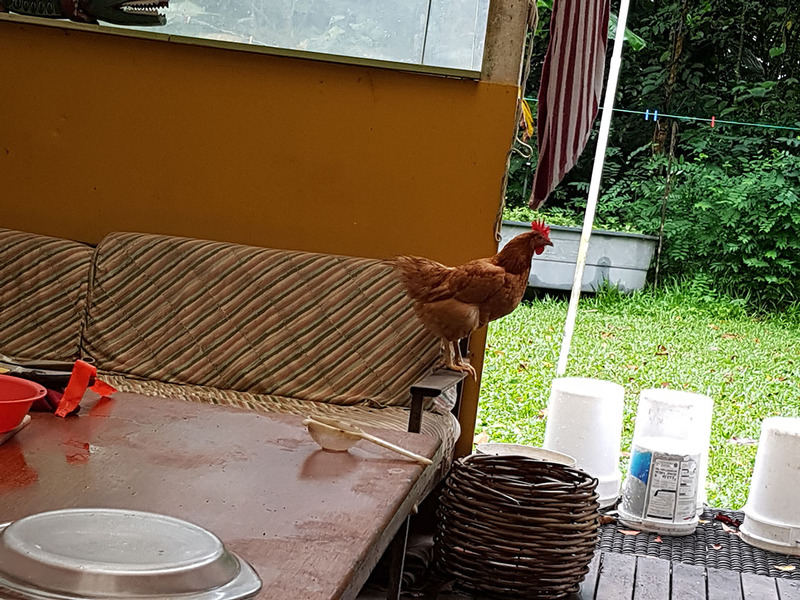 Although Cape Tribulation isn't exactly what you'd call typical country Queensland, some things about country living seem practically universal - like keeping chickens, Almost every home has a backyard hen house. Unfortunately, for better or for worse, many of the chickens are extremely free range, raiding neighbours' kitchens in search of cat food, leaving mounds of sloppy poo on their verandas - and perching on sofa arms. The chook in the picture, sadly, is no longer with us; while running free, she was seized upon and devoured by a local dog. The station is home to a small (current population: four) captive colony of spectacled flying foxes (Pteropus conspicillatus). 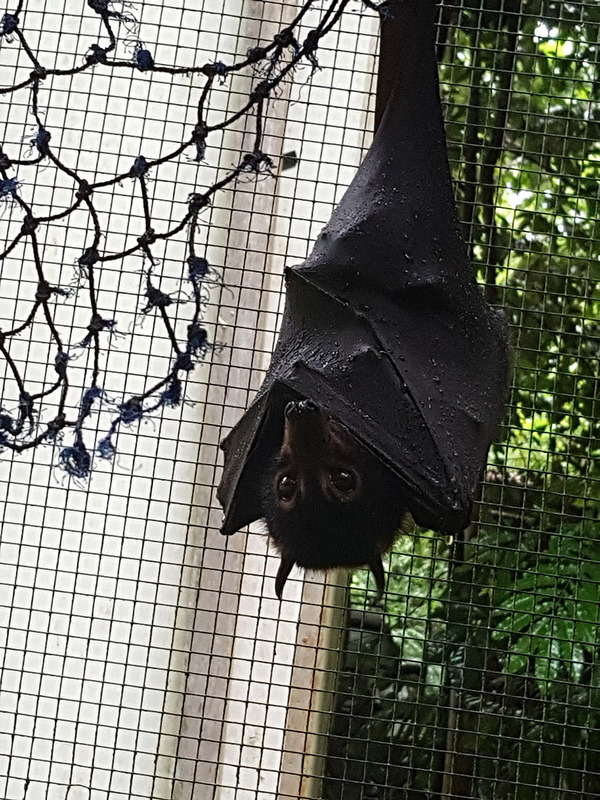 When not involved in behavioural studies, making personal appearances at the Bat House, or showing off for neighbourhood kids, they just kind of hang around, as you can see from this picture taken on a rainy Sunday recently. Interestingly, although their cage has covered areas where they can go to get out of the rain, they don't use them - apparently their built-in "umbrellas" keep their fur dry enough for comfort on even the rainiest days. This small, insulated room takes advantage of the excess heat generated by the station's solar power system and circulates it with a small electric fan to keep the ambient temperature at 30+ degrees (Celsius) with a relative humidity significantly lower than outside (about 60%). 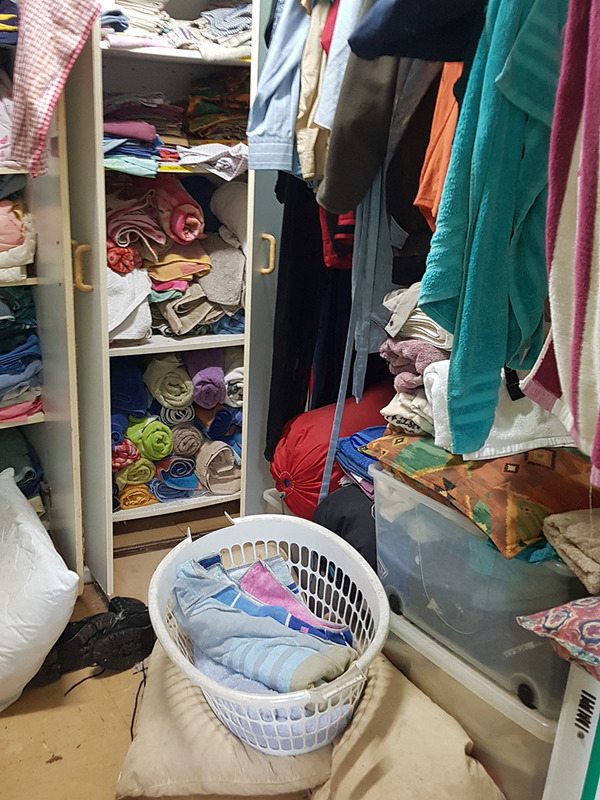 It is the main storage room for clothing, bedding, towels, books, and anything else that needs to be kept dry as well as an emergency dryer for anything that gets wet. This building is the station's main workshop and tool storage area. 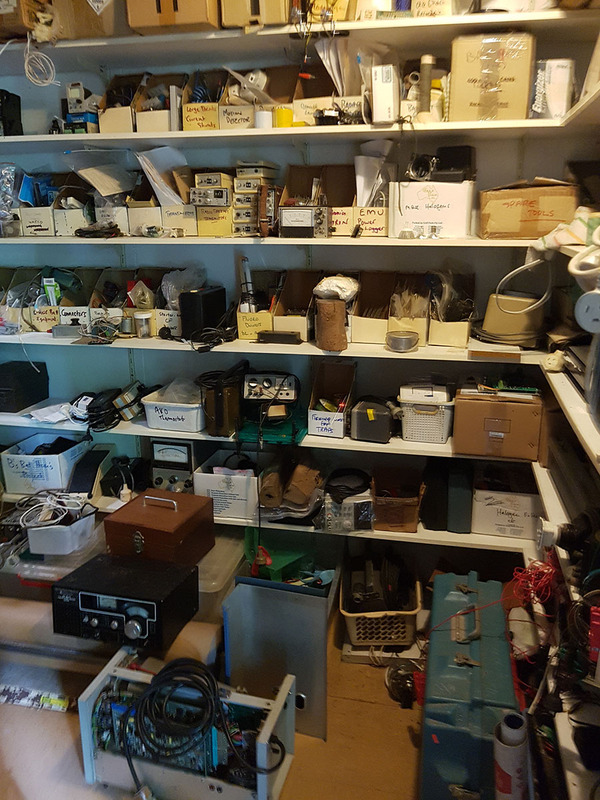 It contains several home-size garages' worth tools, substances and spare parts. 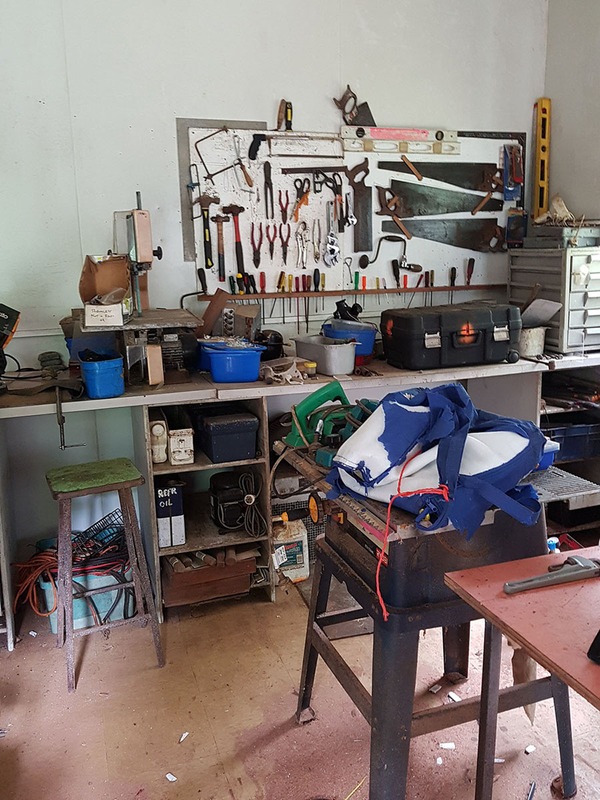 Although it is nominally a workshop, most of the actual repair and upgrading work at the station seems to take place on site or on an improvised trestle table located far from the workshop. This building contains the station's toilet and shower facilities, which are simple but adequate. 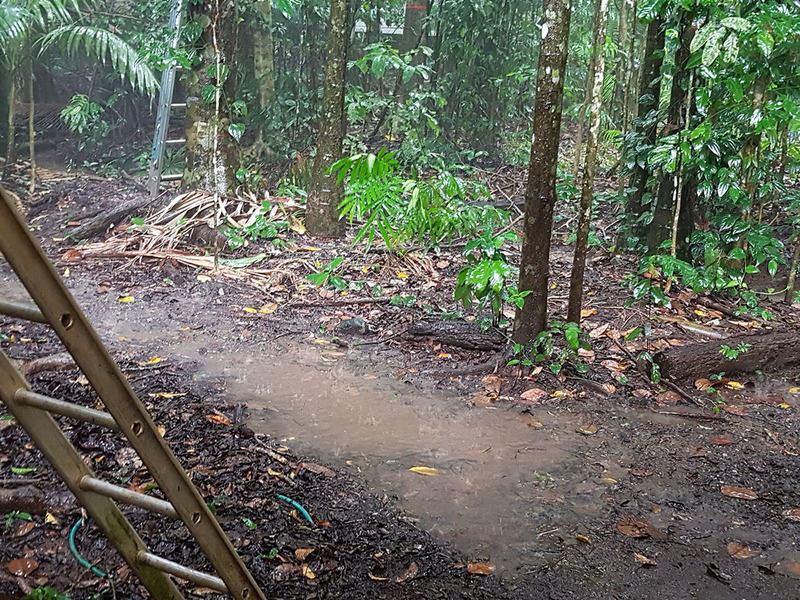 The toilets use a continuous-type composting system which produces a rich, humus-like fertiliser that helps support the station's rainforest regeneration activities. 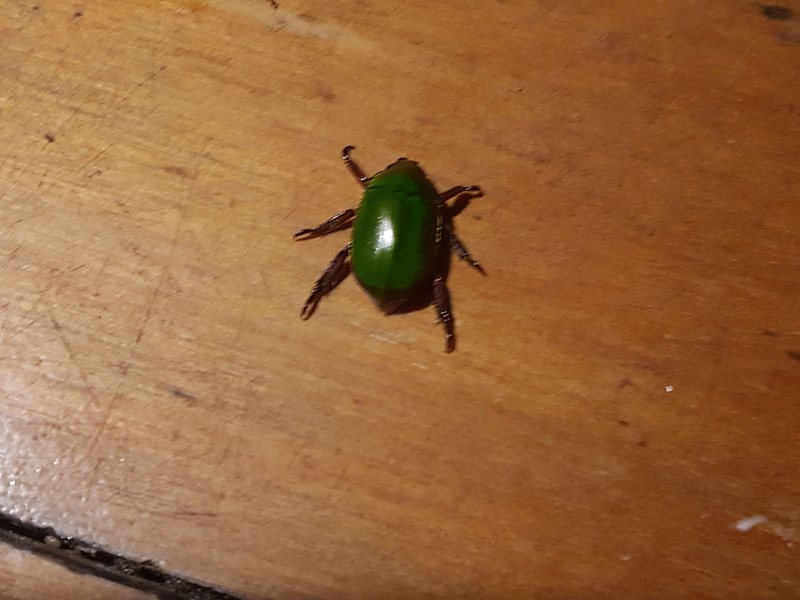 The toilets themselves are basic, easily-cleaned plastic pedestals enclosed in shower-curtained cubicles (Most users don't bother closing the curtains as the rainforest view is so great!) Hot water for the showers is produced by the station's high-pressure solar hot water system. There are six basic wooden cabins at the station, including the director's cabin and one which has been rented to a paying tenant. All of them have broad verandas, electricity, and running water. 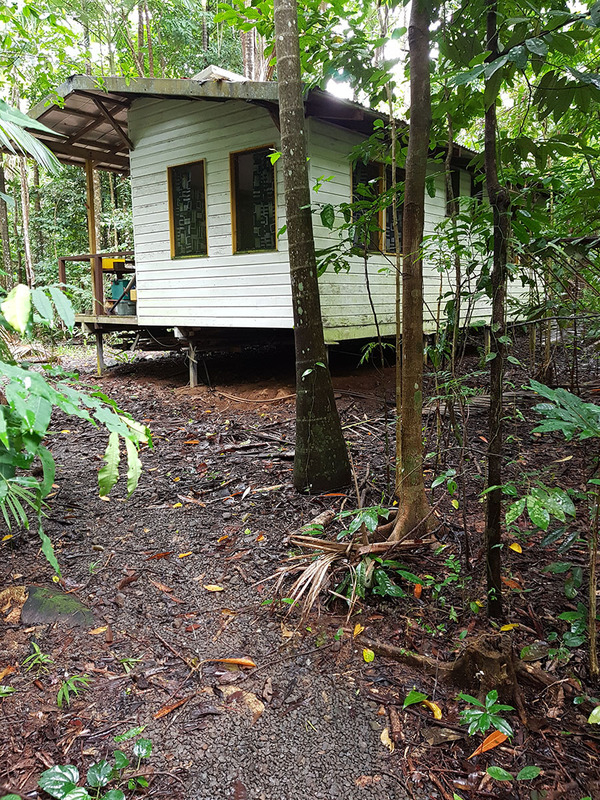 The cabins have been designed specifically for tropical conditions (including the occasional cyclone) with simple, uninsulated walls, screen doors, and unglazed windows to maximise air flow. One feature of the station that visitors often notice first is main horticultural area near the station's entrance. 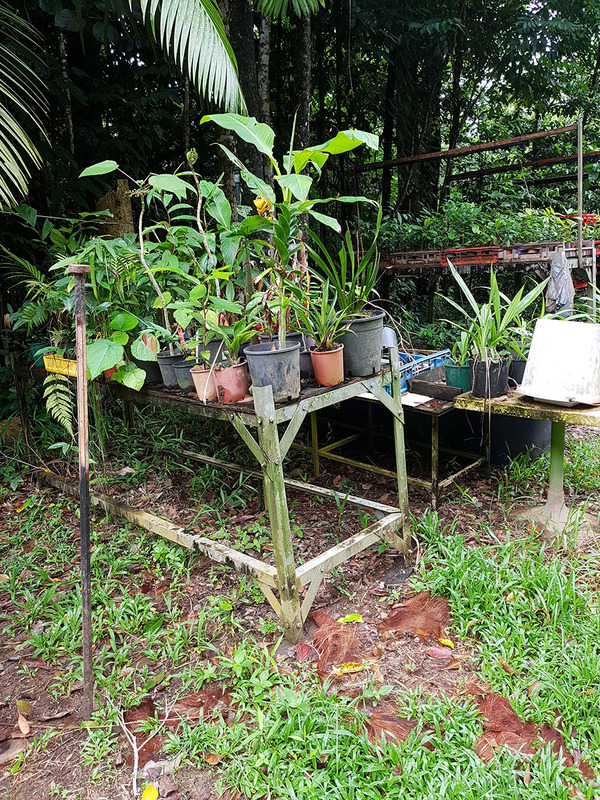 Here, irrigated racks of plants in pots await replanting in the rainforest as part of the station's ongoing rainforest regeneration project. 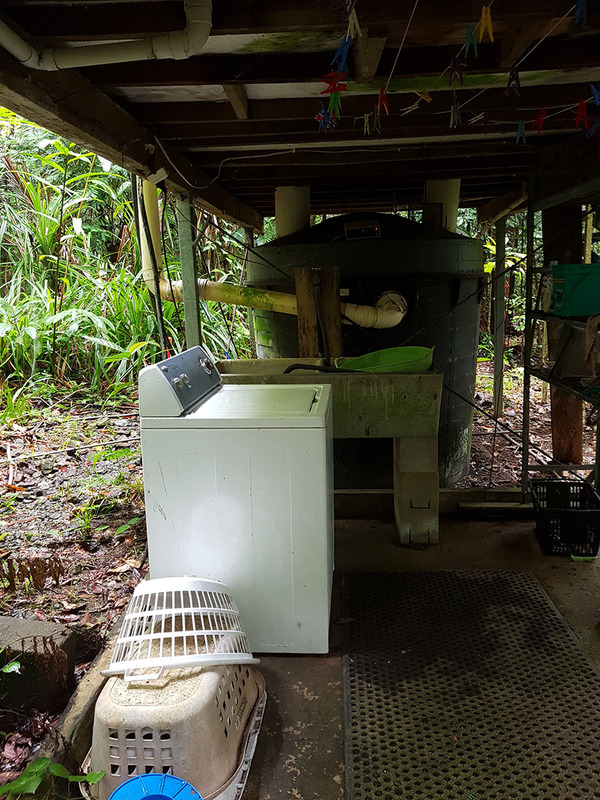 The station's laundry facility consist of one "rescue" washing machine (shown here) and lots and lots of clothes line. The washing machine is mechanically sound, but a tad eccentric and requires a bit of human intervention to guide it through its cycles. The clothes lines in the yard can be propped up with long, lightweight plastic poles to take advantage of the Daintree's scant breezes. 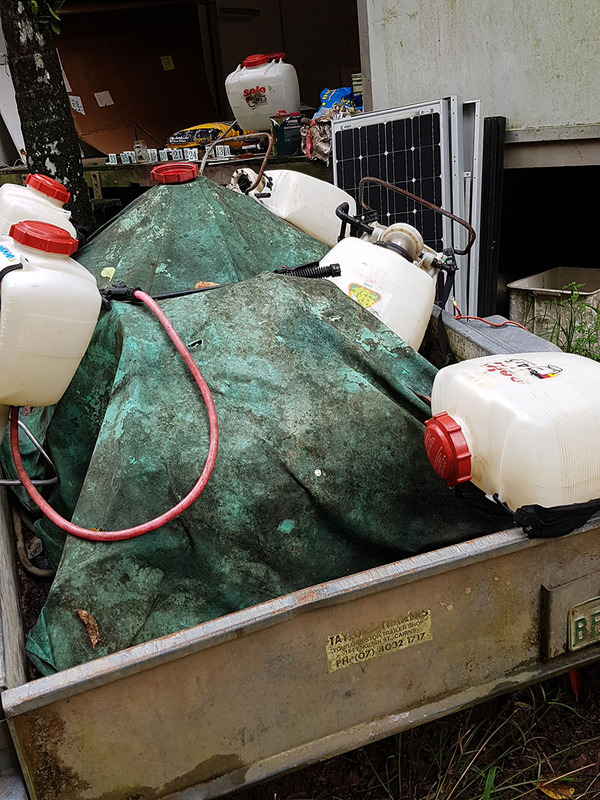 The tank for the composting toilet system can be seen next to the washer. 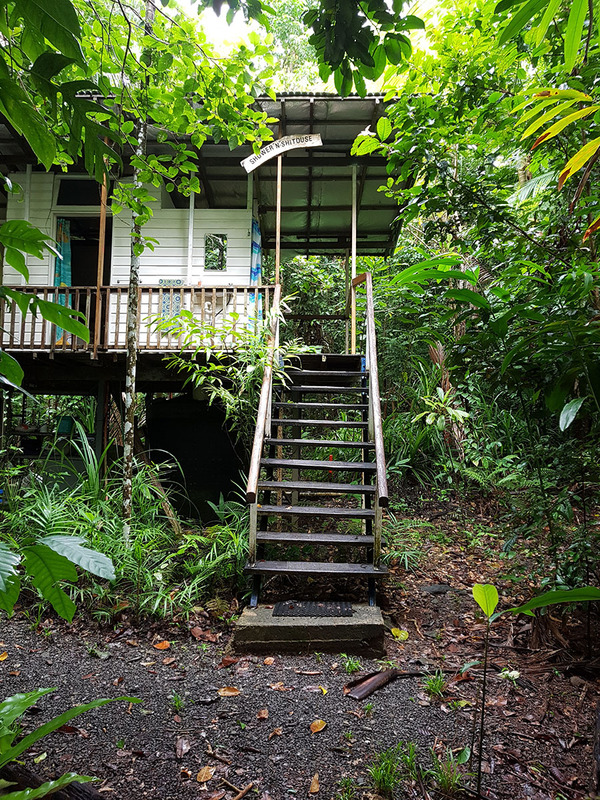 Wiring and electrical connections tend not to last very long in the high temperatures and humidity of the Daintree rainforest. 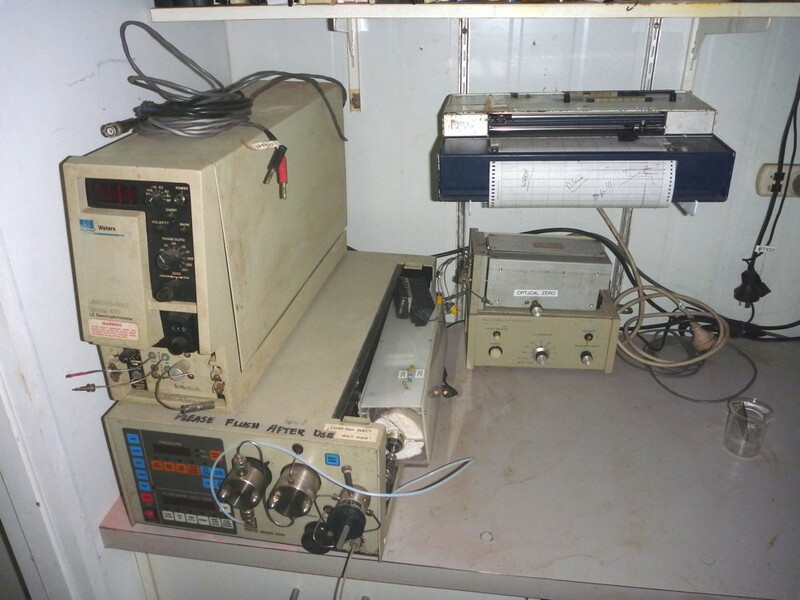 This well-cooked double adapter, formerly located in the dry room, became corroded by the tropical climate. 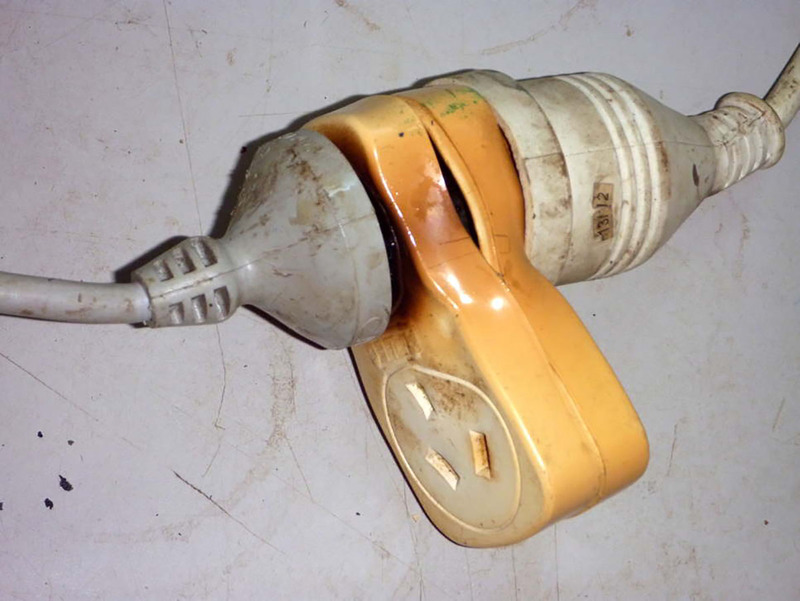 The corrosion increased the electrical resistance inside the adapter, making it run hotter than it normally would and making it susceptible to further corrosion. Eventually it got hot enough to self-destruct. Luckily, it didn't start a fire.